After my lunch with Madame Speaker Pelosi, I know one thing for certain; she was nowhere near Bryant Park this week. Actually, fashion is not her gig. She hates shopping and prefers function over fashion. It makes sense. After all, she is the most powerful female politician in the United States. Mrs. Pelosi doesn’t need to worry if her d’Orsay pumps match her handbag, and she doesn’t care. The issues she deals with are much bigger than the latest styles gliding down the runways in New York, Paris, London and Milan. The only runway she cares about is the one her jet will be landing on in D.C., so she can get back to Capital Hill where 111th Congress has reconvened. So, while others were chatting about the top must-haves for next season, Madame Speaker was generously giving me seven pieces of advice that are substantially more important than the hottest styles. And, unlike the latest fashion trends, her words of wisdom are priceless and will never be out of season. Power. Darling, it is the best accessory of the year. And it goes with everything! 1. Take Notes: That piece of advice was given to Speaker Pelosi by Norman Brokaw, the Chairman of the William Morris Agency. You can find the whole story in her book, Know Your Power (Doubleday 2008). So much information is thrown at us every second, and it is easy to get overwhelmed by everything we have on our plates. But if we just take a few seconds to jot down some notes, chronicle our priorities, and get our thoughts on paper, the weight of our responsibilities can lift from our shoulders and fall onto the paper. It is such a simple, yet powerful act. Indeed, the pen is mightier than the sword. 3. Build Strategic Alliances: Earn others respect and know your boundaries. Speaker Pelosi shares, “We learn that leadership requires vision, judgment, action, and the respect of the American people. No matter how excellent the intellectual appeal, the emotional connection is essential for success.” So much of our relationships are built on emotional bonds and it is important to honor those bonds and value the trust you create. It is vital to have teammates who trust and respect you. 4. Love Others: “Let Other Views Exist.” Many of you reading this piece are not fans of Speaker Pelosi. And chances are you will want to post a message about all the terrible things that Speaker Pelosi has said to offend you. But, if you just let others’ views exist, you’ll have more energy for more productive activities, like spending time with the people you LOVE. She says that we need to recognize other people’s views – through acceptance we can learn to understand them. She never said you need to agree or like their ideas. 5. Organize, Don’t Agonize: When Speaker Pelosi ran for Chair of the Democratic National Committee, a few of the people closest to her did not support her – and some even attacked her. She lost. Two years later, congresswoman Sala Burton asked Speaker Pelosi to run for her seat in congress. So, instead of agonizing about her past loss and what others were saying about her, she organized. 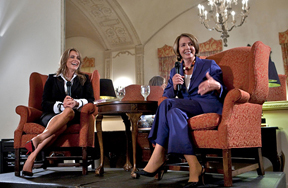 Speaker Pelosi knew that she had an opportunity to bring a woman’s voice to the table as a congresswoman – and to her, that was more powerful than anything some naysayer could do to her. We tend to focus on the bad in our lives and not the wonderful opportunities we are given. Madame Speaker focused on her goals and opportunities and spent no time worrying about her failures. Oh, if we could all do that! 6. “Age Quod Agis”: “Do what you are doing.” With a career like hers, it would be easy to lose track of time, family, and important moments. But one of the tools Speaker Pelosi employs is “Do what you are doing.” She shares, “Whether it is work or play, helping around the house, or entertaining the kids, focus on it.” Focus. Such simple advice, but so powerful. If we all took her simple piece of advice, I believe we would find some space for connection and a solid sense of presence. 7. 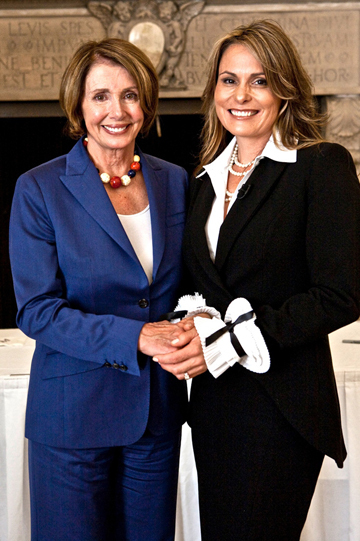 There is no Secret Sauce: When Speaker Pelosi first started in politics, there were only a handful of women in D.C. Because of this, there was a mystique about the “Old Boys Club.” It was though these career politicians knew something that the newcomers-especially women-did not know. They had the “Secret Sauce.” Well, there is no secret sauce! To succeed you need optimism, confidence, and a persuasive argument on the reasons why you are better than your opponent. It has nothing to do with a fabled “secret sauce.” It has everything to do with hard work and commitment. Regardless of how you feel about her political maneuvering, you can’t deny that she has some incredibly powerful advice that each of us can utilize in our daily lives. Not all of us can have lunch with Madame Speaker Pelosi. So, if you want to know more about how this mother of five from Baltimore became the most powerful women in politics, then you can pick up a copy of her book: KNOW YOUR POWER: A Message to America’s Daughters. Many thanks to the Women’s Leadership program hosted by IBM at the Metropolitan Club in San Francisco.